White Lady (also known as a Delilah, Chelsea Side-car and Lillian Forever) is essentially a Sidecar made with gin in place of brandy. The cocktail sometimes also includes additional ingredients, e.g. egg white, sugar and cream. In John le Carré's 1965 novel The Looking Glass War, British spy and main protagonist Fred Leiser's favorite drink is a White Lady, and he makes several attempts to get the other agents to try the cocktail. Left: A bottle of Cointreau, one of the essential ingredients of the White Lady. It is disputed who originally invented this cocktail. There are at least two different opinions. Firstly, that this cocktail was devised by Harry MacElhone in 1919 at Ciro's Club in London. 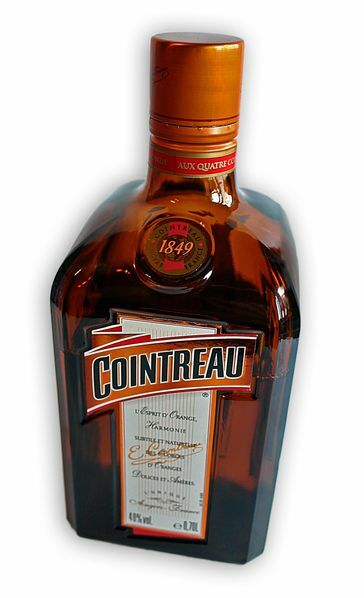 He originally used crème de menthe, but replaced it with gin at Harry's New York Bar in Paris in 1929. But The Savoy's Harry Craddock also claims the White Lady (Gin, Cointreau, fresh lemon juice). The recipe appears in his Savoy Cocktail Book, published in 1930. Mix the ingredients in a shaker half full of ice. Strain and serve in a sugar-rimmed glass.